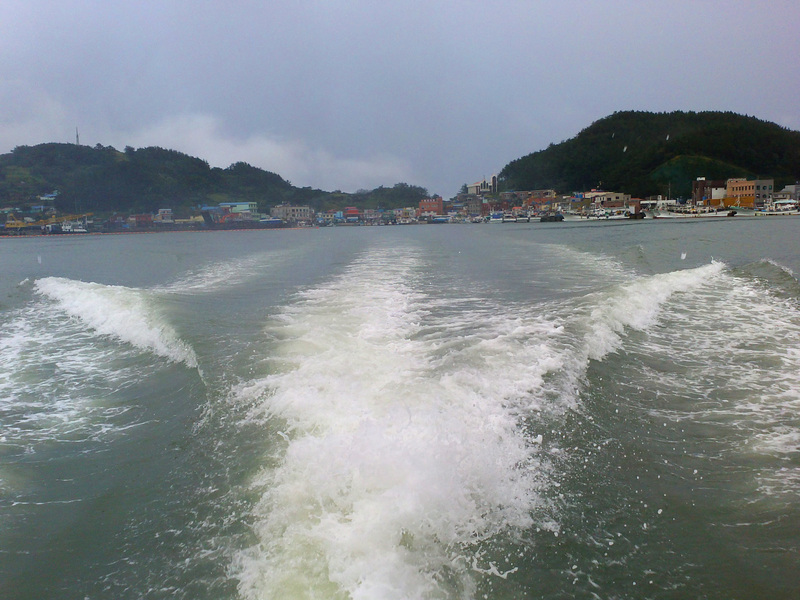 I was invited to go on a pelagic outing around Heuksan-do (흑산도) with several members of Birds Korea. It was a fantastic opportunity to both see some really spectacular birds, and meet some amazing people whose tireless efforts are the cornerstone of the Korean bird conservation movement. It was also a chance to utilize my least-used field guide, Onley and Sconfield’s Albatrosses, Petrels and Shearwaters of the World. I arrived at the Gwangju Bus Terminal bright and early in the morning, meeting my travel companions Maria Lisak, Dr. Nial Moores, Jason Loghry, and Ha Jung-Mun. Dr. Moores and Jason left on an earlier bus; we would meet them at the other end in Mokpo, where we would pick up our ferry to the island of Heuksan-do. As the three of us loaded onto our bus, I suddenly realized I had left my field guide sitting on the desk in my apartment. Not off to a good start. 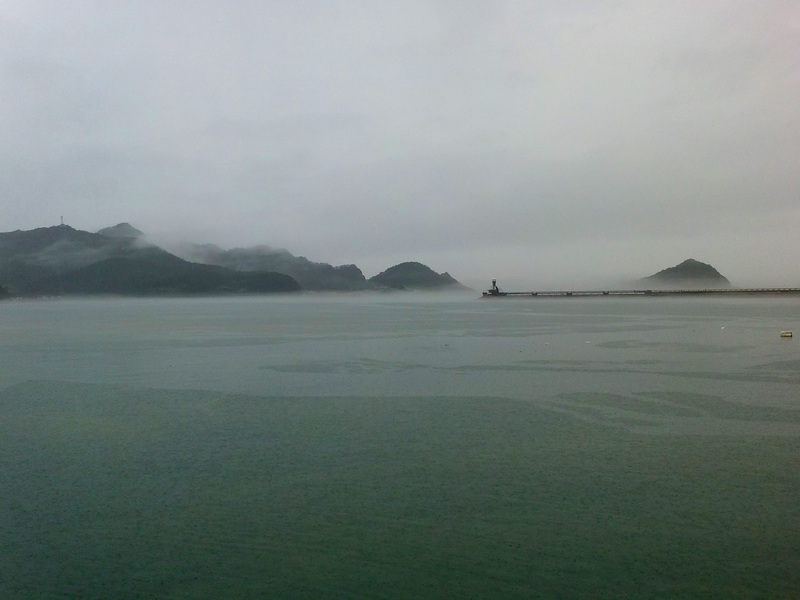 By the time we reached Mokpo, the skies had darkened and it began to rain. As we met up with the rest of our group, and were taxied onto the ferry, the rain increased from an annoying drizzle to a window-blocking torrent. For the length of the two and a half hour voyage, the rain mocked our feeble attempts at spotting tiny seabirds in the worsening swell. Oh, perhaps I had forgotten to mention the typhoon that was currently beating the pulp out of Taiwan a few hundred miles to the south of us. Yeah, that’s an important detail. The bay at Heuksan-do. Oh yeah, we’re going out in this! Nevertheless, Dr. Moores somehow managed to spot a few Swinhoe’s storm-petrels and a streaked shearwater on the ferry ride; I only got the briefest of glimpses of the former, and completely missed the latter. As luck would have it, the rain followed us all the way to Heuksan-do, and continued drenching everything in sight for another couple hours. But ours was a determined bunch, and after resolving a slight miscommunication with the boat captain we had hired, we set sail into the great beyond, spirits high if not a little damp. As we tied off from the dock, the skies began to lighten a bit and someone turned off the faucet. The clouds (and the rain for that matter) would stay for the bulk of the day, but there were occasional breaks in the sky and by nightfall we were granted an amazing sunset. Let’s hope it ends a little better, shall we? Despite the break in the weather, the open ocean tossed us around with 1-3m swells, and sporadic downpours left our fearless leader soaked to the bone. 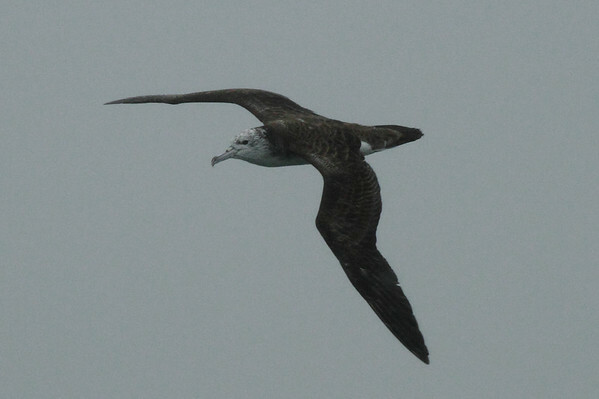 Conditions were far from ideal, but the one great thing about pelagic birding is that the birds have nowhere to hide, except another featureless stretch of ocean that you’re not looking at. Tons of perseverance (and an equal amount luck) can usually result in a few good birds. We spent almost five hours at sea. The birds came in waves, usually in singles or pairs, but sometimes in flocks of ten or more. We stumbled onto a group of three red phalaropes about an hour into the voyage. Swinhoe’s storm-petrels and streaked shearwaters were seen throughout the trip, though long periods would pass between sightings. Our ship’s captain wasn’t chumming the waters, so the birds tended to stay out a fair distance. We also found half a dozen common terns, and near the end of the trip we passed seven red-necked phalaropes, followed shortly by a distant view of a flesh-footed shearwater. Unfortunately for Yours Truly, however, I never managed to get on this bird, so I will have to try for it some other time. Streaked Shearwater (Calonectris leucomelas); this was the only bird that came in close enough to our ship for a photo. Luckily the battering waves didn’t spoil the opportunity for me. When we returned to Heuksan-do, we decided to use the last of the dwindling light to search the marina area for some birds. 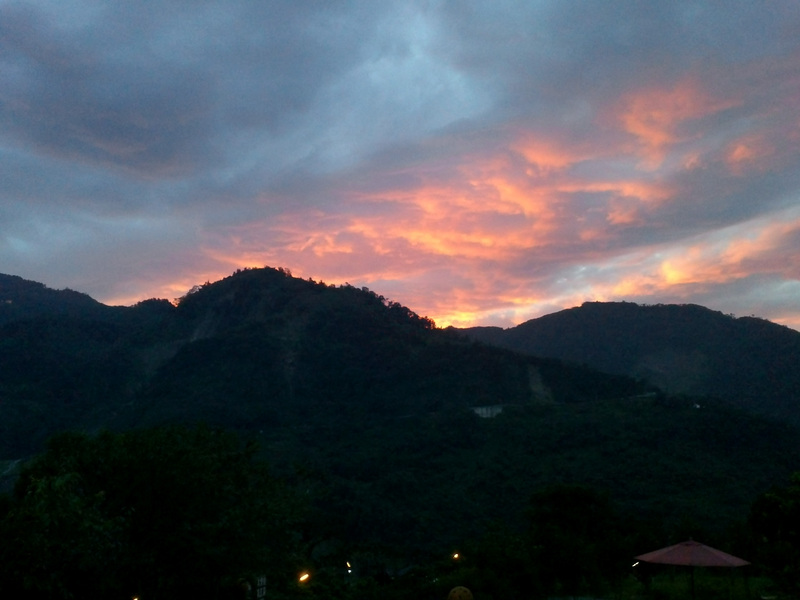 The skies were alive with Pacific swifts, hawking insects over the mountains. Within the swifts we found three white-throated needletails, and Jason managed to spy a rare Himalayan swiftlet, a scarcely recorded species on the Korean peninsula. There were also migrants coming in to Heuksan-do for a night’s rest, including an astonishing flock of at least 100 eastern yellow wagtails, which cruised over the marina before disappearing into the mountains. Pacific Swift (Apus pacificus pacificus) – note the outstretched tail feathers and small fork in the middle. 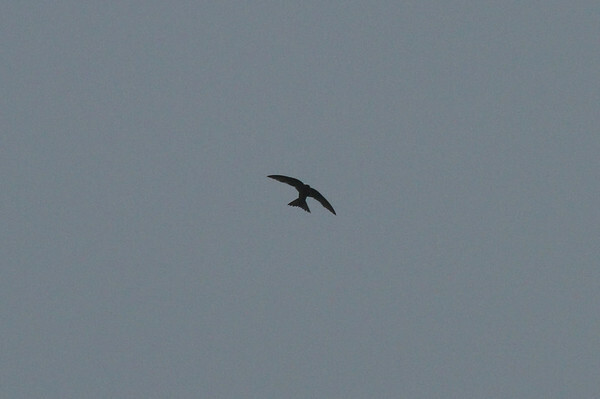 Not my best shot, but it is the first time I’ve photographed a swift of any species. The next morning, our group strolled around Heuksan-myeon, looking for migrants and passerines. 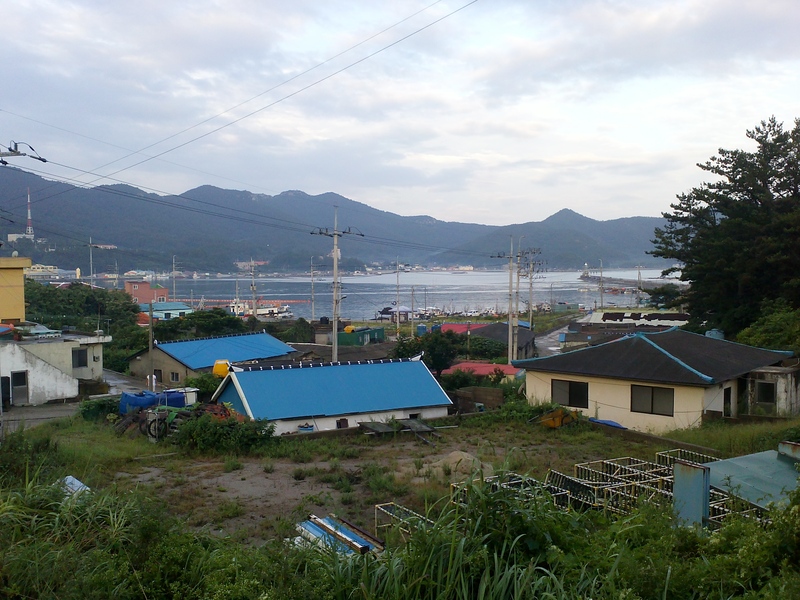 The island of Heuksan-do is sparsely populated, the bulk of which resides in the quiet village of Heuksan-myeon. The rest of the island is mostly uninhabited, and so offers some great birding for those willing to make the trip. After the dismal results of our pelagic trip, the birding around Heuksan-myeon more than made up for it. The sleepy village of Heuksan-myeon. The village had two pairs of blue rock-thrushes, and we were treated to excellent views of both the males and females. We also saw plenty of light-vented bulbuls, another rare species in Korea (though it is starting to become more common on the offshore islands). 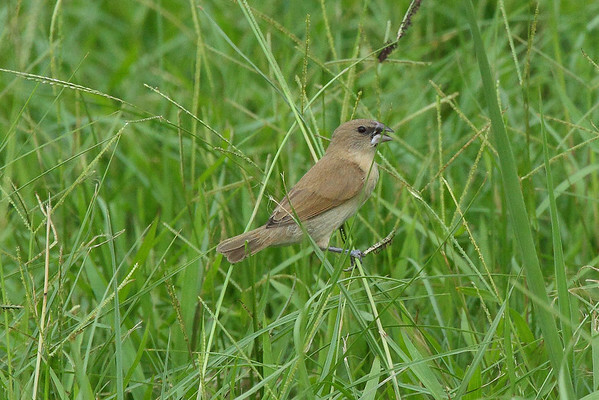 A family of three tiger shrikes patrolled a large hillside, and Japanese white-eyes flitted about everywhere. Eastern yellow wagtails and grey wagtails continued their migrations overhead, but nowhere near the numbers of the previous night. The mountain path came to a small pasture for grazing animals, and it was here that we found the bulk of our species. As three pin-tailed snipes flew off overhead, we spotted several Pacific golden-plovers foraging in the pasture; a long-toed stint was found near a puddle on the edge of the pasture. A pair of Daurian starlings flew in, and two grey-streaked flycatchers and a Korean flycatcher patrolled the edge of the area. By far the strangest sighting was a lone Eurasian wryneck, a cryptically-colored woodpecker which looks more like a nightjar than a woodpecker. Before returning to the village, we saw one more interesting bird. It appeared to be a strange-looking eastern yellow wagtail, but several field markers and some call notes it made belong to the western yellow wagtail. These two closely related species are hotly contested, and most recent taxonomic updates continually change the species from two, maybe one, sometimes even three, different species. 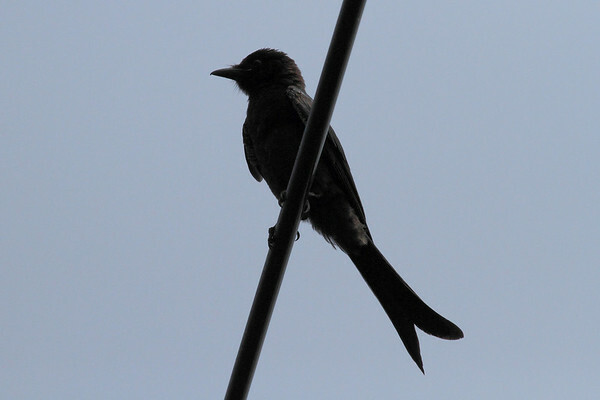 Photos and audio recordings were made, but for now this bird remains unidentified. 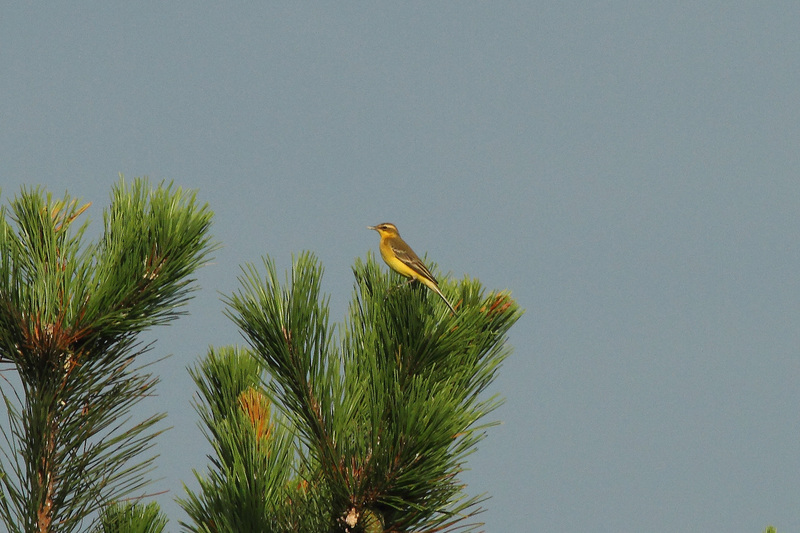 Eastern or Western Yellow Wagtail…anyone know? We walked along some of the shoreline of the island, picking out a few sanderlings and red-necked stints, as well as one black-winged stilt hiding in the debris on the beach. Later a flock of four of these graceful waders would fly in from the north. 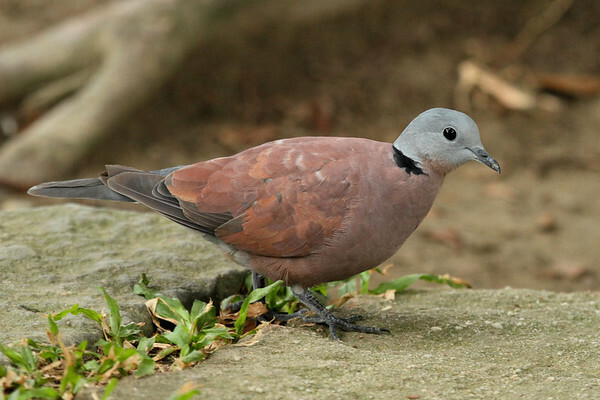 The last bird of interest was a gorgeous Japanese wood-pigeon, which flew from its hiding place on one mountainside to another across the valley. From my point of view the outing was a great success. It’s always a good time to be out birding with a group of like-minded individuals, and it never hurts to have such knowledgeable companions either. Despite the rain we contended with on our first day, the pelagic trip was still successful in that we found some birds and didn’t get completely shut out. And the day’s birding on Heuksan-do was a great chance to see some unusual birds that don’t frequently show up on the Korean mainland. A heartfelt “thank you!” to Dr. Nial Moores and all of the members of Birds Korea for putting together a wonderful outing. I hope it will be one of many yet to come. Here is a complete list of all the birds seen throughout our trip to Taiwan. Where available, I have included a link to photos of each species. There are 89 species listed. Taiwan endemic species are listed in CYAN. It was before dawn when we awoke. Seemed like only a few hours ago we were just getting into bed, enjoying the warm afterglow of birding victory. Why does morning always feel so…early? It’s hard to wake up angry with a view like this out your window. I had no sooner tied my shoes and strapped on my bins, than off we went into the mountains, following the same road we had taken to the blind yesterday. Spotted doves and Japanese white-eyes were the first birds we found, hearing their calls in the early morning light. 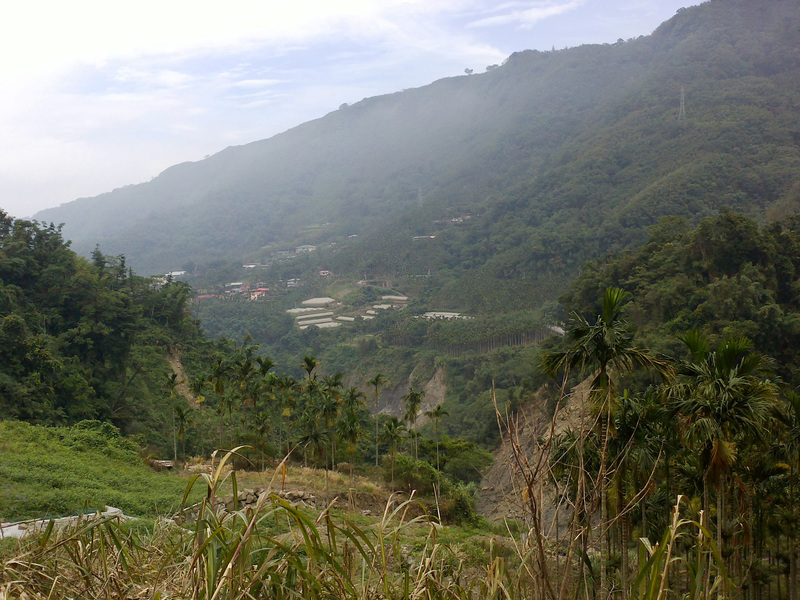 Tea is grown on the mountainside around the Firefly Homestay, and interspersed in the plantation are betel nut trees. Between two of these trees we found an enormous spider, easily as big as my hand. Only a little further up the road, still in the same plantation, was another of these behemoth arachnids. I suspected them to be poisonous, and they are, though a bite is rarely lethal. 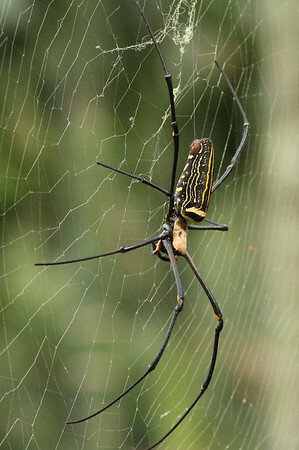 The spiders belong to the Nephilidae family, the golden orb-web spiders, which comprise the largest spiders in the world. The venom has a neurotoxic effect similar to the black widow spider, though not nearly as powerful. Most bites disappear within 24 hours. Nevertheless, I would not want one of these crawling around on me. 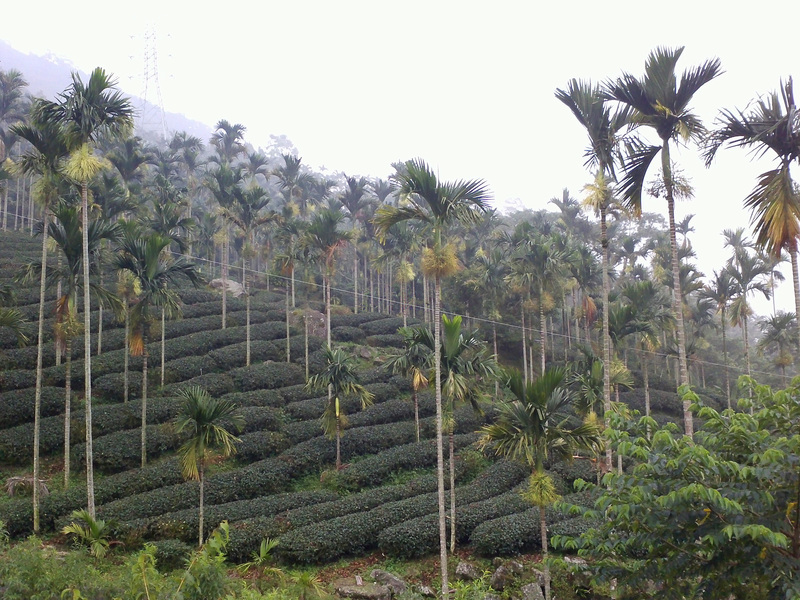 The tea plantation adjacent to the Firefly Homestay. The tall palms are betel nut trees. As we entered the mountains, the birds became more vocal, but much harder to see. We could hear three Steere’s liocichla calling to one another, but none would show themselves. A white-tailed robin put in a brief appearance, as did a small flock of rufous-crowned babblers and white-eared sibias. I was cleaning up with new species (not to mention picking off the endemics one by one), but many of the birds went unseen or offering the briefest of glimpses. Maddening! On our way back to the Homestay, ready for some breakfast and a change of location, we heard two black-necklaced scimitar-babblers and a Taiwan scimitar-babbler calling in the forest around the Homestay. Both endemics, and both remained out of sight. Luckily, I managed to snap a photo of a rufous-capped babbler in the tea plantation, and a grey-cheeked fulvetta gave good views of itself, but remained too far away to be photographed. 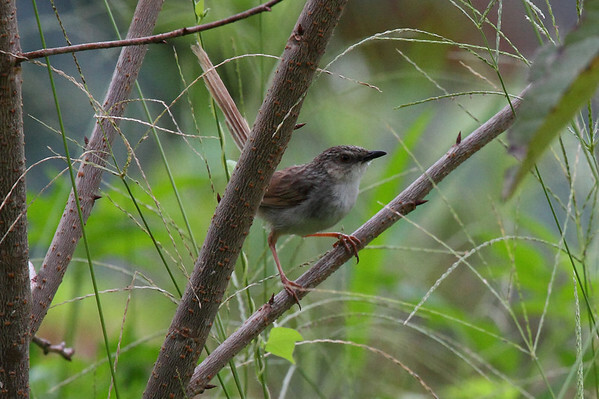 At the Homestay, collared finchbills and white-rumped munias foraged on berries, and a striated prinia popped up to voice his displeasure at our intrusion. We had a hearty breakfast courtesy of our gracious hosts. At some point while we were out on the mountain, another group of foreigners/birders had arrived at the Homestay. We exchanged some pleasantries, but they were just starting their breakfast as we were finishing ours, so there wasn’t much time for chit-chat. And all too soon, we said goodbye to the Firefly Homestay and Guanghua. Our tour continued. We headed northeast, towards Alishan and Yushan National Parks, where a small change in altitude would bring a large change in species. 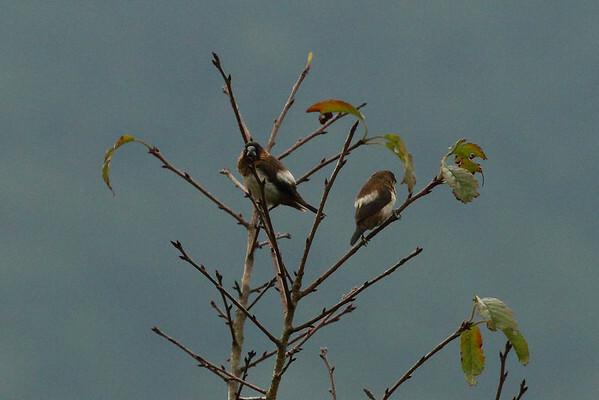 We stopped along the road to Alishan at several locations, scouting out the forest edge for any interesting birds. It was here that we located three white-bellied pigeons perching on an electrical line stretching across the valley. White-eared sibias and Steere’s liocichla were fairly common, and we managed to rack up a few more lifers with sightings of bronzed drongos, plumbeous redstarts, vivid niltava, and a distant Taiwan whistling-thrush (endemic!) perching along a riverbed in the valley far below. Pacific swallows filled the sky in tightly formed flocks, and in one group we picked out a half dozen silver-backed needletails. 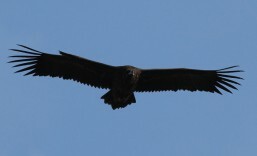 We even got spectacular views of a crested serpent-eagle gliding over the valley on the thermals. However, as before the birds tended to stay high up in the trees, high above or below us on the mountains, or in constant motion. Photography was not going to be the order of the day. The mountain valley near Guanghua. Somewhere on the opposite mountainside is the Firefly Homestay. Far below a small stream runs through the valley. 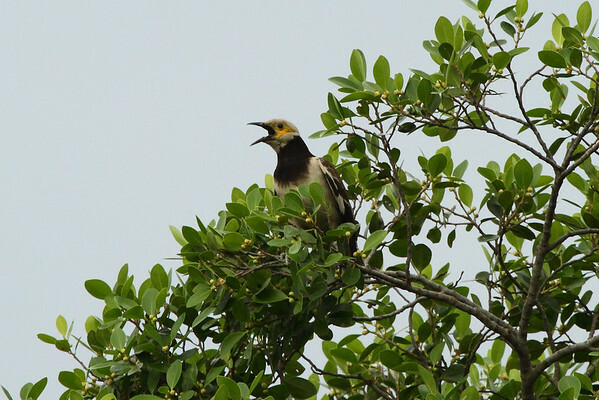 The “Taiwan” subspecies of Crested Serpent-eagle (Spilornis cheela hoya); this subspecies differs greatly in appearance compared to mainland serpent-eagles. We had been birding the roadside for about twenty minutes when we noticed another group of birders coming up towards us. It was the two other guests we briefly met at the Homestay. They had a guide with them as well, and as Melanie and I scanned one side of the road and the two other birds scanned another, our guides got to talking among themselves, trading reports on what was being seen in the area. They’re looking for rufous-crowned laughingthrush. The other guide says he needs this bird. They missed the Swinhoe’s pheasant and Taiwan partridge this morning, so they’re trying to make up for it. The guide says he’s seen a lot of birds. He’s the best birder. Melanie asked Richard if the other guide had mentioned a name. He hadn’t. Now my interest was piqued. I took a good look at the man, and there was something vaguely familiar about him. He was much older, and equipped with the usual birder fatigues I was used to: drab khaki clothes, a vest with a thousand pockets, binoculars around the neck, a well-worn field guide in the vest pocket, a look of keen determination on his face. That’s when it clicked for me. He was a good birder. In fact, he literally was the best birder in history. On a random mountain road in the middle of Taiwan, I was birding a few feet from Tom Gullick! For those who do not hang around the coffee shops during the Fall and Christmas Bird Counts, or religiously dial into the local RBA hotline, the name Tom Gullick probably doesn’t ring a bell. But for birders, and listers in particular, there is no name more famous. Tom Gullick has seen more bird species than anyone else on Earth. 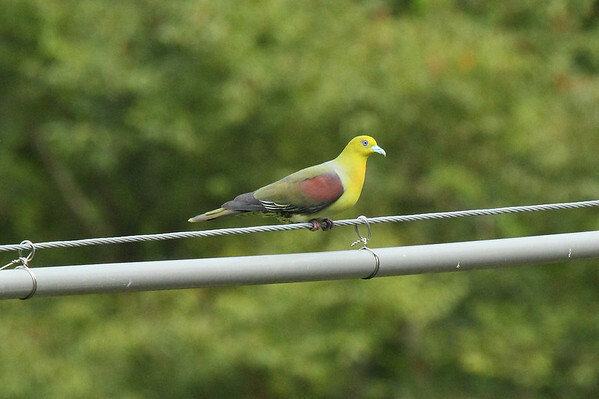 In October 2012, he made this monumental achievement by spotting the Wallace’s fruit-dove in Indonesia, making him the first person ever to officially see 9,000 species of bird. Putting that into perspective, there are only about 10,500 bird species known to science – Tom Gullick has seen nearly 90% of those. 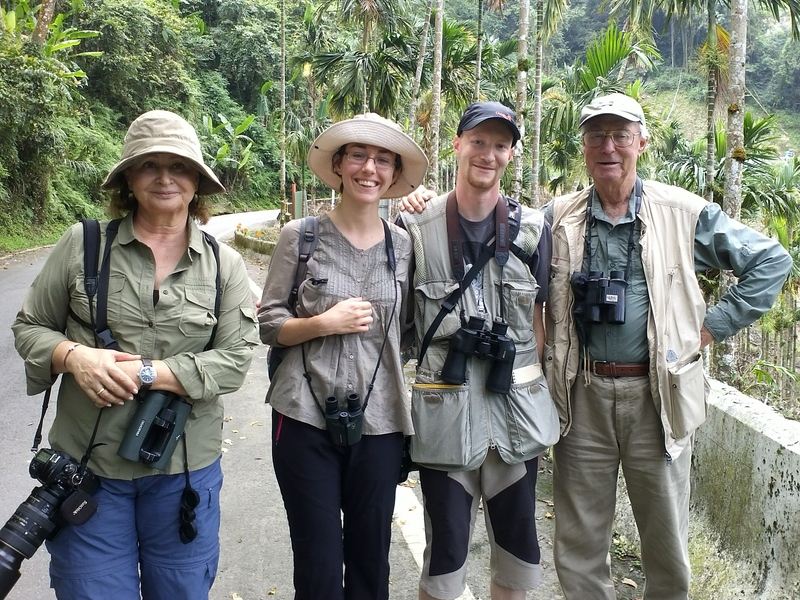 So what do I do when I’m standing next to birding history in the Taiwanese mountains? I do what any starstruck amateur would do…I ask for a photo! I’m standing next to the greatest birder on Earth!!! From left: Patricia Maldonado Vidal, Melanie Proteau Blake, Yours Truly, and Tom Gullick. Not long afterwards, having been unable to locate the laughingthrush, we parted ways and wished each other good luck. I think I mentioned in previous posts the serendipity of birding…well, here’s another example. What are the odds of meeting the greatest birder on Earth, especially when he wasn’t even supposed to be in Taiwan, but for a freak storm forced to change his plans until the weather cleared? We had tallied another 14 lifers as we said goodbye to Guanghua and Chiayi county. But the day was far from over, and two National Parks awaited me on the other side of the mountains. Islands are phenomenal natural features. It was the unique nature of islands that gave Charles Darwin the hints he needed to decipher the theory of natural selection. From a birding perspective, islands offer diversity and rarity that isn’t often found on the mainland. 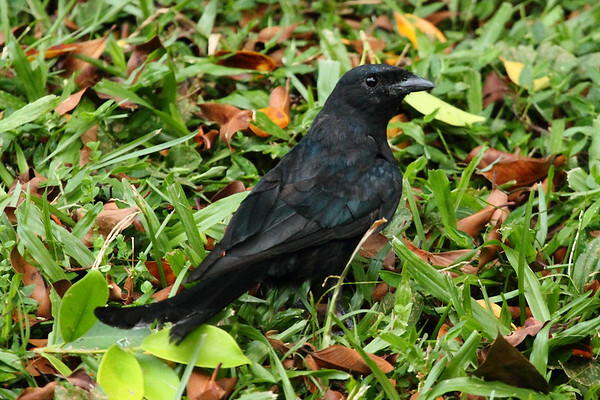 For the lister, islands offer the most coveted of listable birds: the endemics. 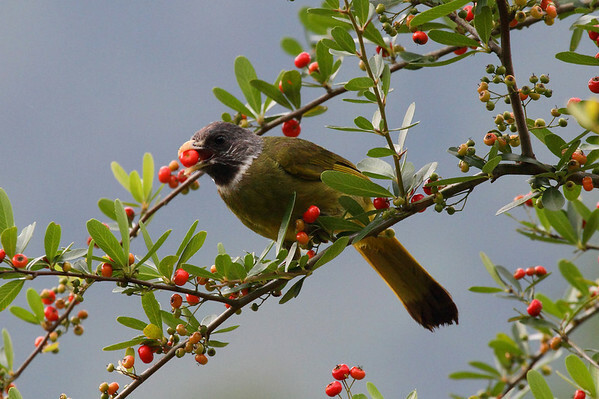 Taiwan has approximately 23 endemic species of birds, and nearly twice as many endemic subspecies that will likely become species of their own in time. Endemic bird species and subspecies account for about 19% of all the birds species found on the island nation. Since an endemic species is found nowhere else on the planet, any trip to a place with endemics means you have to really work to get them all – you can’t get them anywhere else. The purpose of our trip to Taiwan was not about birds (at least, it wasn’t only about birds). And the time of year was far from ideal. I had hoped get the majority of the endemics in Taiwan, but I knew I would need professional help (no pun intended) to accomplish that lofty goal. I was going to need a guide. I went with Birding@Taiwan, which had come recommended from a post on 10,000birds.org as well as from word-of-mouth from a birding guide in Thailand that I had contacted earlier in the summer, when we were still planning to go to Thailand. My guide was Richard Chen, a knowledgeable, certified tour guide with eight years experience leading birding tours in Taiwan. I was impressed with his professionalism and knowledge, even before we had arrived in Taiwan. There were no empty guarantees, and he was up front with pricing, the itinerary, and what we could hope to find for the time we had and the lateness of the season. When a typhoon swept through Taiwan and forced one of our primary destinations to close down for the season, Richard immediately informed me and had an alternative itinerary within a few days. Bottom line: for my first international birding tour guide experience, I was greatly impressed and would do it again anytime. If you’re thinking of birding Taiwan, I would recommend having a look at Birding@Taiwan. We booked for three days, two nights. The itinerary had us checking the mudflats at Jincheng Lake in Hsinchu City, then heading into the mountainous interior of Taiwan for two days in Chiayi and Nantou counties. The mountains would provide us with the majority of our endemics; it was too early in the season for shorebirding to be productive, but it was worth a look nonetheless. This itinerary also had the added benefit that Melanie and I would be able to travel throughout most of the country, and see parts of it that would otherwise be hard or impossible to get to. 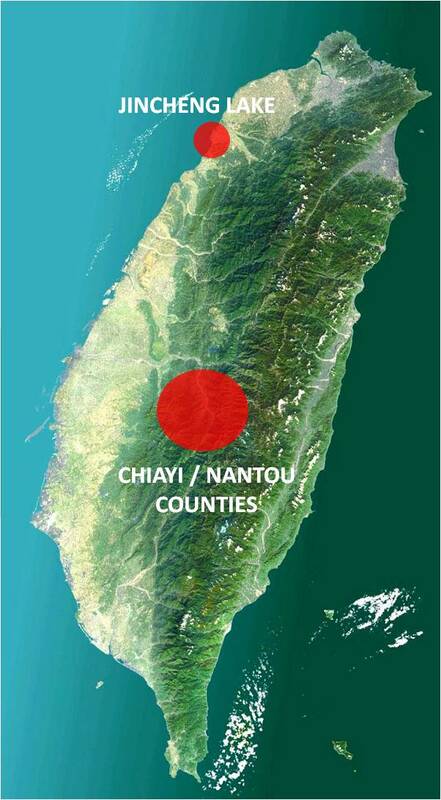 Satellite image of Taiwan – our birding locations are shown in red. On August 12, Richard arrived early in the morning to pick us up at our hotel in Taipei. We then drove to Hsinchu City, missing most of the morning commute. Near the entrance to Jincheng Lake, Richard pointed out about 40 black-winged stilts foraging in a rice paddy. Wood sandpipers and cattle egrets were also on the paddy, and barn swallows hawked insects in the air. 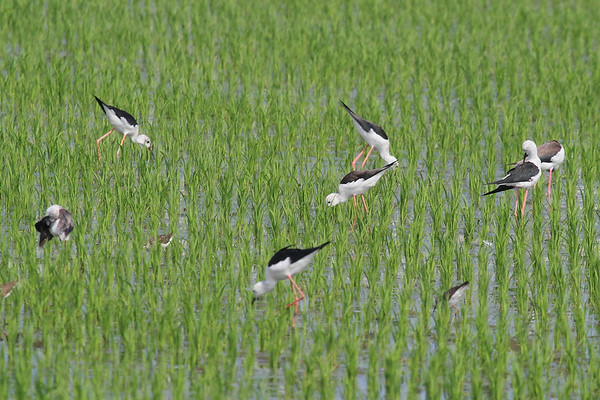 “White-headed” Black-winged Stilts (Himantopus himantopus leucocephalus) foraging on a rice paddy. Several Wood Sandpipers (Tringa glareola) can also be seen in this photo. It was a gloriously hot day, so any time spent in the sun carried a heavy price. We suffered through it, scanning the mudflats thoroughly before calling it a day. For our efforts we were rewarded with views of Kentish plovers, grey-tailed tattlers, common greenshanks, two greater sand-plovers, and singles of common redshank, terek sandpiper, ruddy turnstone, and Asian dowitcher. There were also plenty of sacred ibises on the mudflats, and Pacific swallows glided through the air looking for insects. 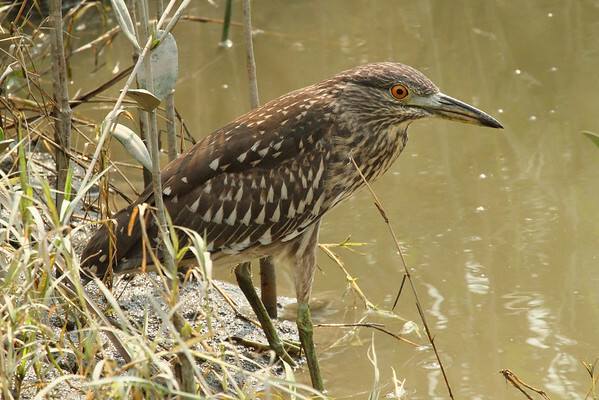 The woods and Jincheng Lake itself did not hold much bird life, although black-crowned night-herons were plentiful, and a juvenile Chinese pond-heron was a nice surprise. As we were preparing to leave for our next stop, I spotted two nesting black-winged stilts. I thought it was too late in the season for nesting birds, but I am not familiar with the nesting behaviors of this species, so it may be an attempt at a second (or third) brood before the fall migration. 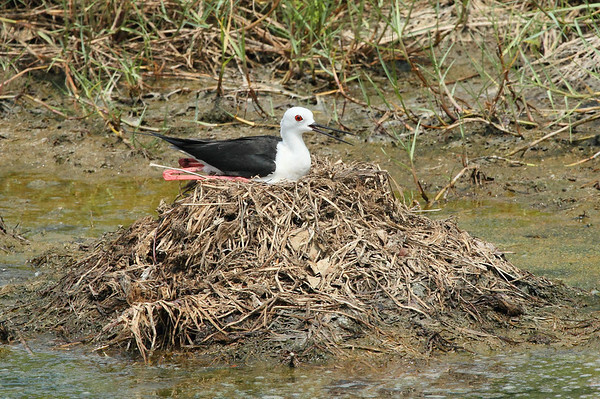 A nesting Black-winged Stilt, its mouth open to try and dissipate the heat of the day. Click the photo to see a video of the bird on the nest. The only other birds of interest were several black drongos, three plain prinias that gave impeccable views of themselves, and a lesser coucal that called out repeatedly as we loaded into the car, though never showed itself. Off to a good start, we left Jincheng Lake with five lifers tallied. 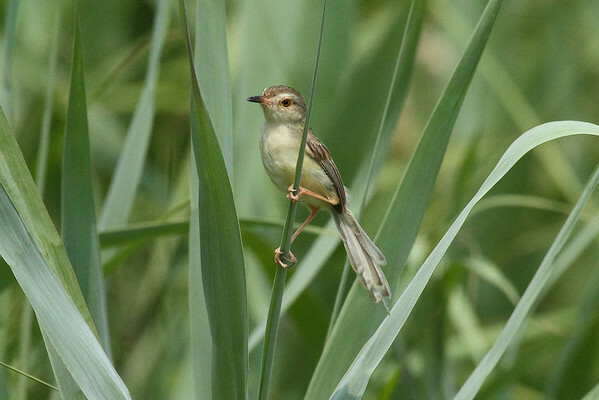 The endemic subspecies of Plain Prinia (Prinia inornata flavirostris). One day this bird may become its own species. The next port of call was the tiny village of Guanghua, in the Dingbenzai region of Chiayi county. Richard was certain we would find two out of the three endemic pheasant species here, and he had reserved us a place at the Firefly Homestay. The ride to Chiayi county was uneventful, as we drove along seemingly endless miles of Taiwan’s highway system. A long winding mountain road, which offered breathtaking views next to nausea-inducing hairpin turns, led us deep into the county. We arrived at our destination some four hours later. We had just enough time to put our things in our room, take a quick pit stop and have some homegrown tea with the owner of the Homestay, and then we were whisked off onto a nearby mountain where our quarry presumably awaited us. The Firefly Homestay in Guanghua village. Our private room with a view at the Firefly Homestay. This is the only way to go birding in the field. 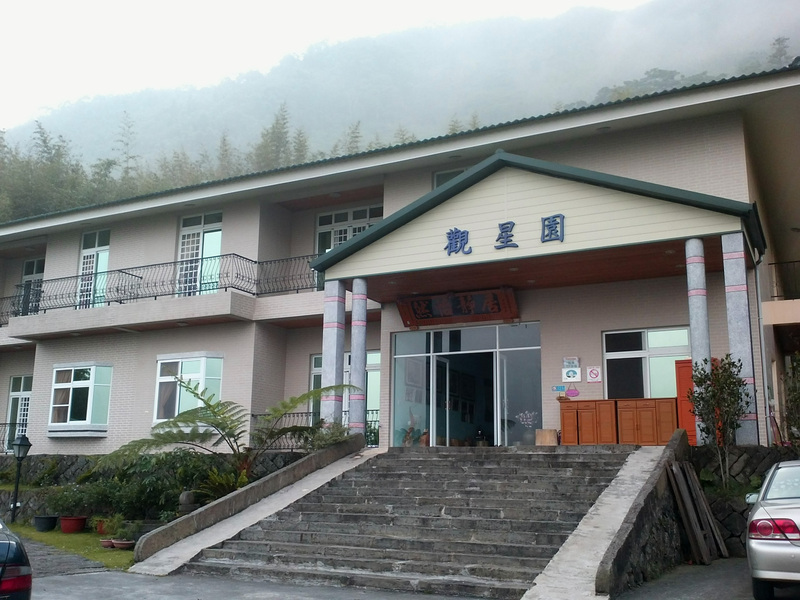 The owner of the Firefly Homestay is also a leading conservationist in the area, and maintains a viewing blind in the mountains for visitors to observe Taiwan’s endemic pheasants at close range. 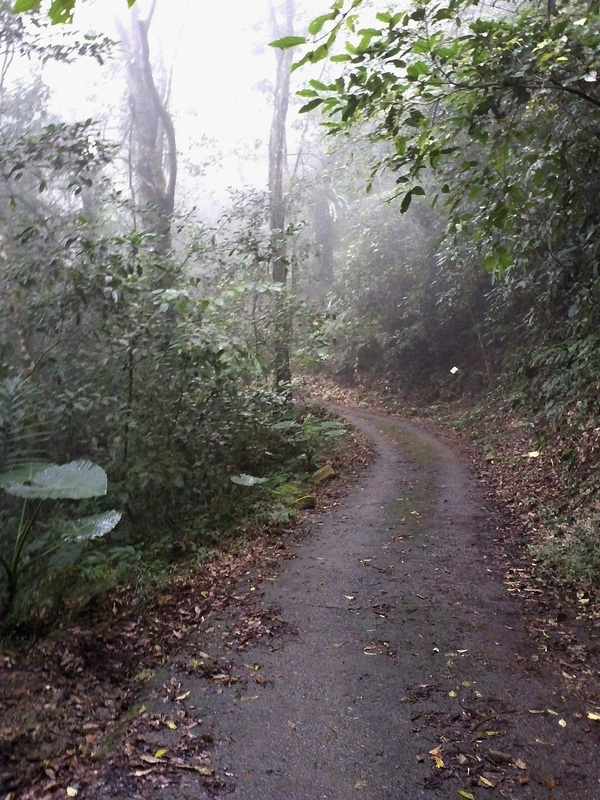 A small one lane road, hardly worthy of the name, snakes its way up the mountain to an uninteresting part of the forest. On the way there, we spotted three Chinese bamboo-partridges; though not our target species, they were nevertheless a welcome sight. Where are you taking us again? Reaching the Blind, we made ourselves comfortable on the stools provided. And we waited. The cicadas began calling. Fog rolled in. The sky threatened rain, but never delivered. We waited. A white-tailed robin made a brief appearance, jumping from one fallen log to another before flying off to someplace more interesting. More cicadas…more waiting. Then, movement! Oops, false alarm. Squirrel. Knowing that you play the game by the bird’s rules, and have to work on their timetable, I settled in for the long haul. It was just after the first hour had passed that Richard suddenly stiffened up, and yelling as loudly as a whisper would allow him, got my attention onto an approaching bird, who was silently tip-toeing his way down the mountainside towards the blind. It was a beautiful male Swinhoe’s pheasant, one of our main target species! He pecked around for minutes at a time, scratching at the fallen leaves to dig up something to eat. I snapped as many photos as I could, but in the dim light of the heavy woods, many of them came out blurred. Fortunately I was able to get one decent shot to remember this moment. 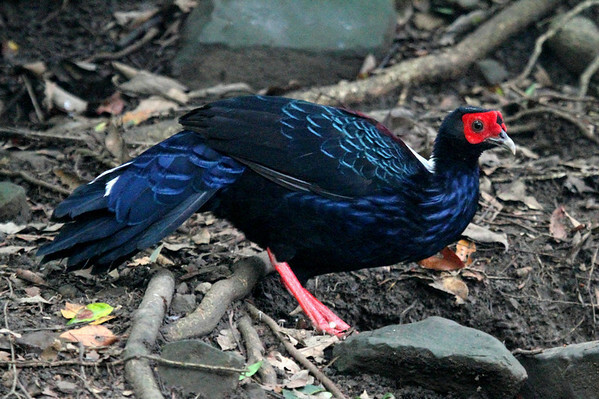 Swinhoe’s Pheasant (Lophura swinhoii), an endemic to Taiwan. Click the photo to see a short video of this bird foraging. The pheasant suddenly cocked its head, picking up a sound that had escaped the three of us in the blind. Shortly thereafter it vanished into the underbrush. We scanned the area to see what had frightened him off, but came up empty. 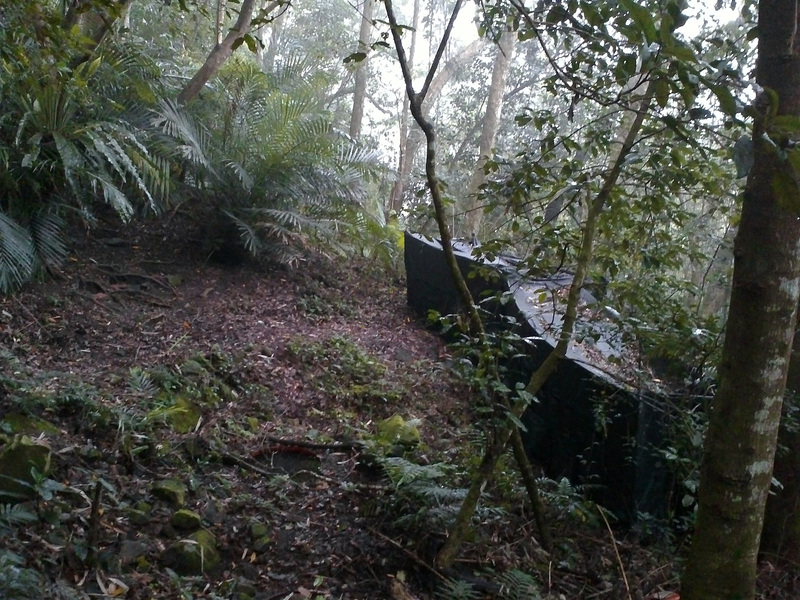 Then I caught movement to the left, halfway up the mountainside. Something small, and moving quickly (and silently) through the undergrowth. It emerged a few minutes later, creeping confidently to where the Swinhoe’s pheasant had been moments earlier. 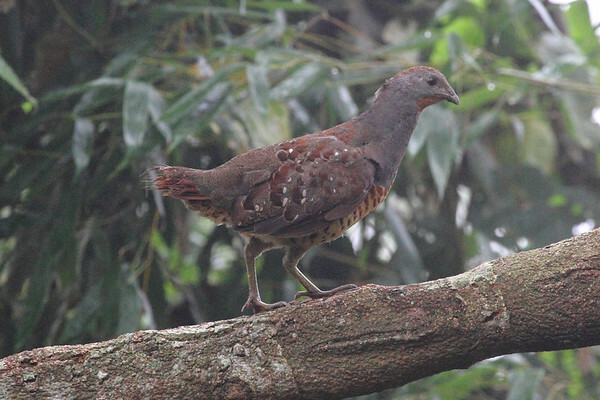 It was a Taiwan partridge, our second target species! This bird seemed overly confident, and foraged near the blind for tens of minutes. Once again, though, the dark light prevented me from getting any decent shots. This poor image was the best I could do; fortunately my camera also records video, so I made up for the poor photographic opportunities with some documentary filming. Please forgive the shakiness of the video: a 400mm is a pretty heavy lens to carry around, let alone hold still for minutes at a time. Note to self: invest in a solid tripod if you ever go into the jungles again. 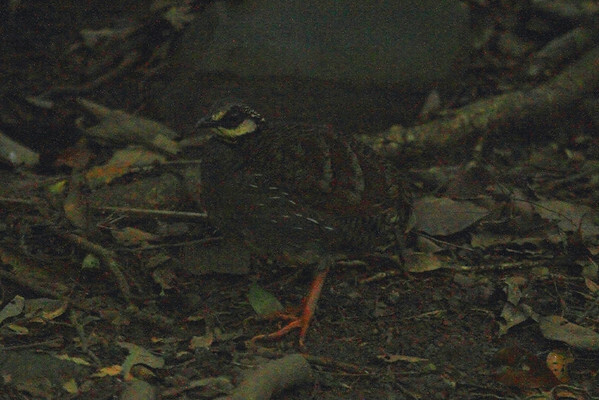 Taiwan Partridge (Arborophila crudigularis). Click the photo to see the video of this bird foraging. Eventually the partridge retreated into the forest, and other than a short reappearance of the Swinhoe’s pheasant (who apparently was afraid of the much smaller partridge) and another white-tailed robin (or perhaps the same one), nothing else happened at the Blind. We left there happy to have seen the amazing species we came all this way for. Before the day ended, Richard had one more surprise for us. 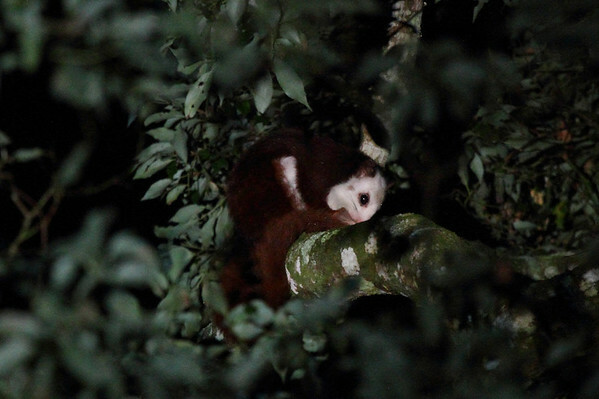 The mountains around the Homestay host nearly a dozen pairs of the rare white-faced flying squirrel, and the owner of the Homestay knows where many of them are. So the three of us met up with a small group of locals (who I think were family members of our hosts) after dinner and returned to the forest. Armed with a spotlight, laser pointer, and some audio equipment, our fearless host found at least five of the nocturnal squirrels. 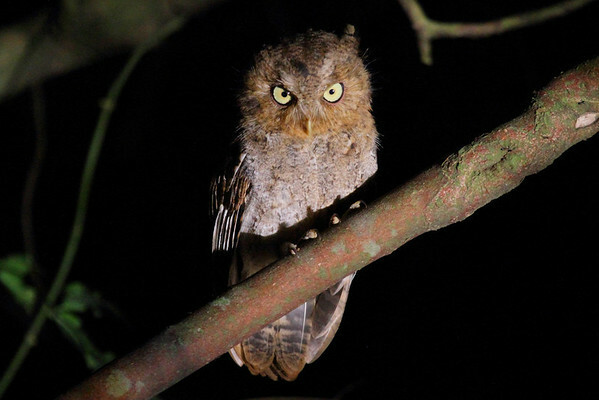 And to my happy surprise, he used the audio equipment to call in three mountain scops-owls. One even posed for the group, giving my first actual view of an Asian owl since arriving in South Korea almost seven months ago. 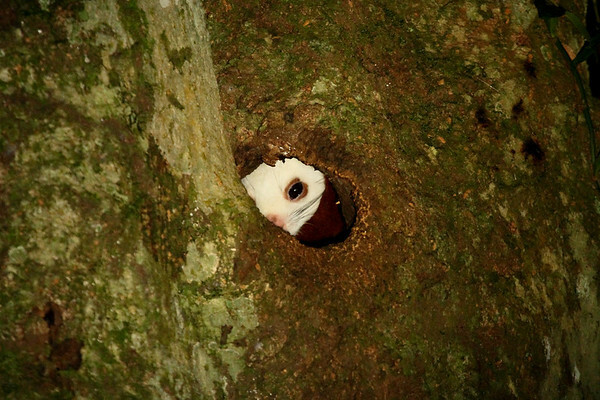 A female White-faced Flying Squirrel peaks out from her burrow, preparing for a night of foraging. We ended the night by touring the grounds of the Homestay, looking for another of Guanghua’s notable attractions: glow-in-the-dark mushrooms. The mushrooms are very small, but are phosphorescent and emit a soft green glow in the dark. Their small size doesn’t lend themselves to photograph well, at least not with my equipment, so you will have to take my word for it that these mushrooms do in fact glow in the dark. After all this excitement, it was off to bed. Richard had us penned in for a pre-dawn excursion to check off some more birds, and nothing would prepare me for what (or rather, who) I would find in the morning. Visiting Taiwan, you say? Not particularly interested in birds / birding / standing next to a 400-year-old Buddhist temple, looking in the opposite direction with binoculars trained at some distant bird-like silhouette on the horizon? Gasp! Doth my ears deceive me? For readers without birds on the brain (literally and figuratively), I’ve compiled a short list of must-see attractions in Taipei City, geared toward those with only a few days to spare. 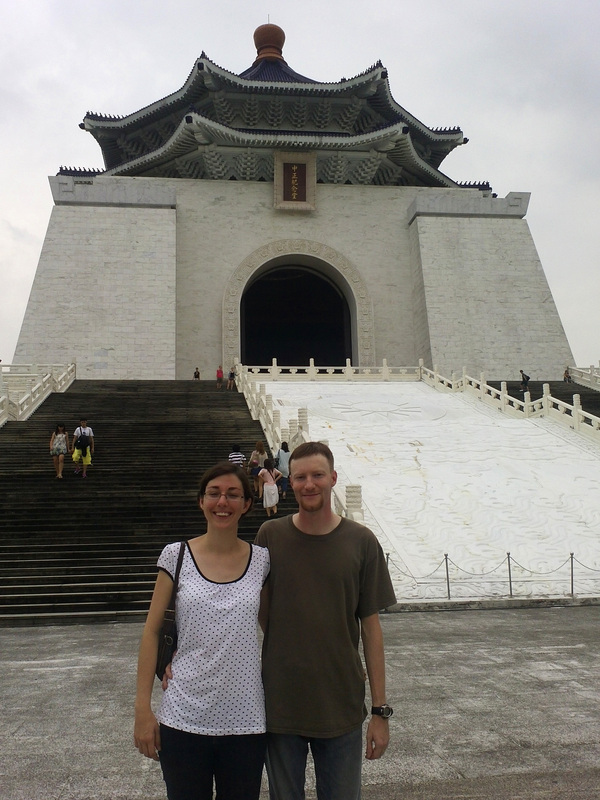 These are just the sites that Melanie and I actually visited; there are so many more things to see and do in Taipei City, so get out there and explore! 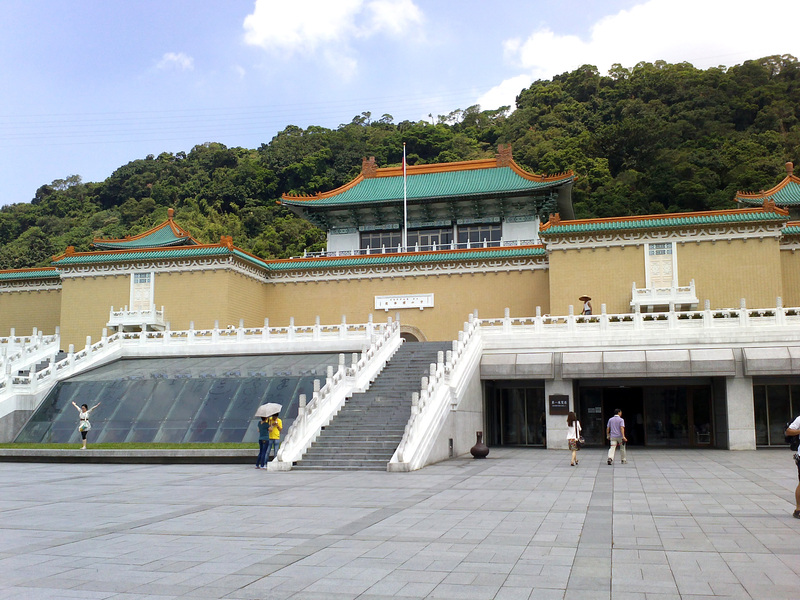 How to get there: The National Palace Museum is located in the Shilin district of Taipei City. There are several ways to get there. You can take the Tamsui Line (Red Line) of the MRT and get off at Shilin Station, then take a Red 30 bus to the Museum. Other buses that will get you close the Museum are 255, 304, 815, and Minibus 18 and 19. Alternately you can take the Wenhu Line (Brown Line) to Dazhi Station and take a Brown 13 bus to the Museum. Lastly, getting off the Wenhu Line at Jiannan Road Station and taking a Brown 20 bus will also take you to the Museum. 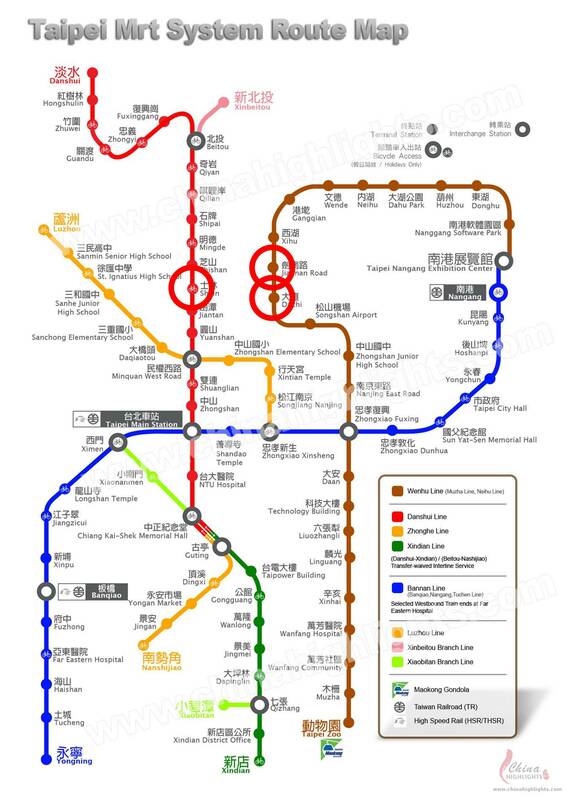 MRT Map to the National Palace Museum. Each station mentioned above is circled in red. Why go there: Besides the amazing grounds and architecture, the National Palace Museum is a national museum of the Republic of China, and houses some 700,000 artifacts covering nearly 8,000 years of Chinese history. The Museum was originally established in Beijing. 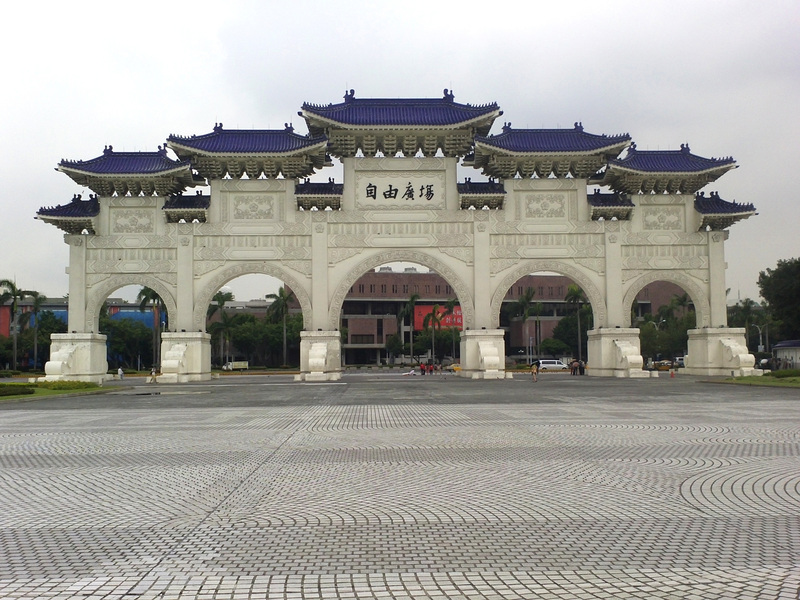 During the Chinese Civil War, it was relocated to Taipei. Only about 22% of the artifacts from the Beijing Museum were transported to Taiwan, but these represent some of the finest pieces in the collection. Photography is prohibited within the Museum, so you will have to see the collection for yourself. Numerous artifacts, ranging from rare book collections to Imperial items to works of art, are on display at the National Palace Museum. 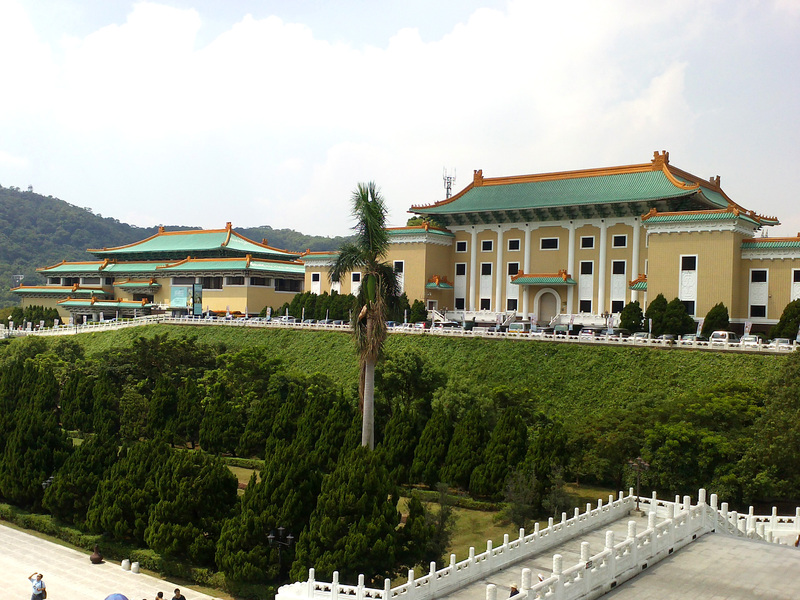 The main entrance to the National Palace Museum. Overlooking the grounds of the Museum. Be sure to grab a bite to eat at the Sanxitang Teahouse on the fourth floor. Adjacent to the National Palace Museum is the Zhishan Garden. Tranquil koi ponds and quiet winding paths weave their way across the Garden. Large koi are kept in the ponds, and several covered pagodas offer shade and relaxation. 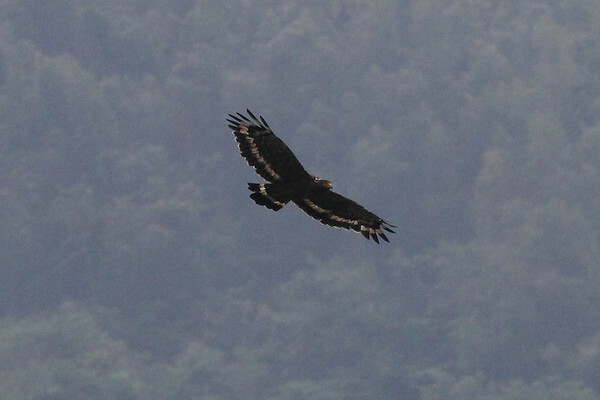 There is also enough habitat to attract wildlife, including black-crowned night-herons, Malayan night-herons, black drongos, Taiwan barbets, and even crested serpent-eagles riding the thermals over the surrounding mountainside (I found three of these birds soaring overhead during my visit). 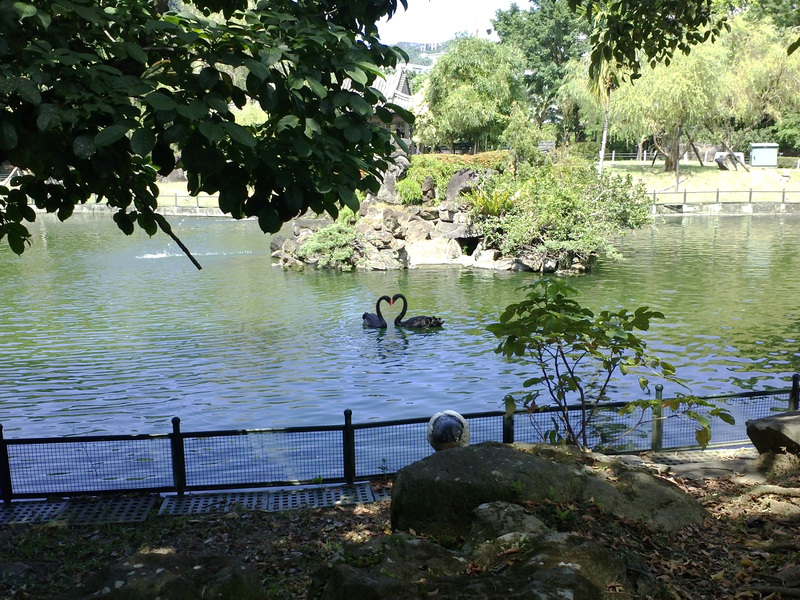 The Museum also keeps a pair of black swans and other domestic waterfowl on site. The Zhishan Garden, adjacent to the National Palace Museum. 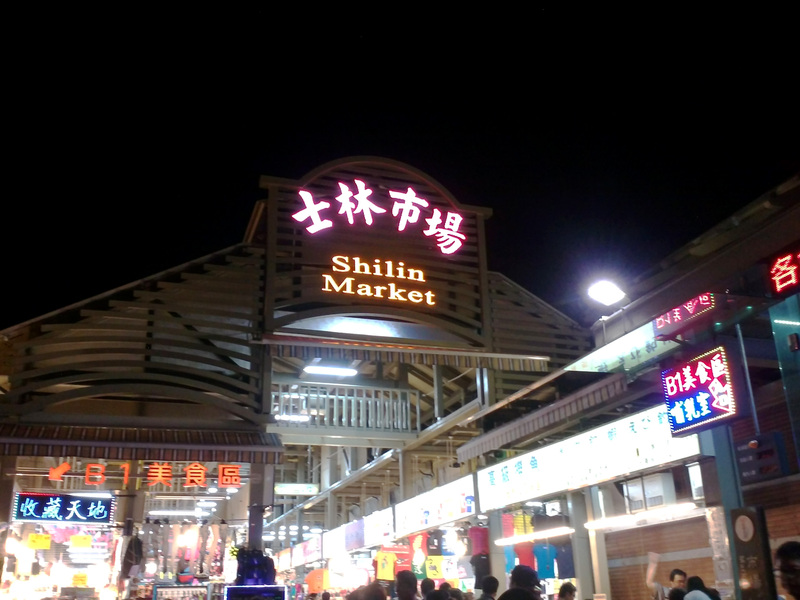 How to get there: The Shilin Night Market is easily accessible via the MRT Tamsui Line (Red Line); get off at the Shilin Station and you’re there. 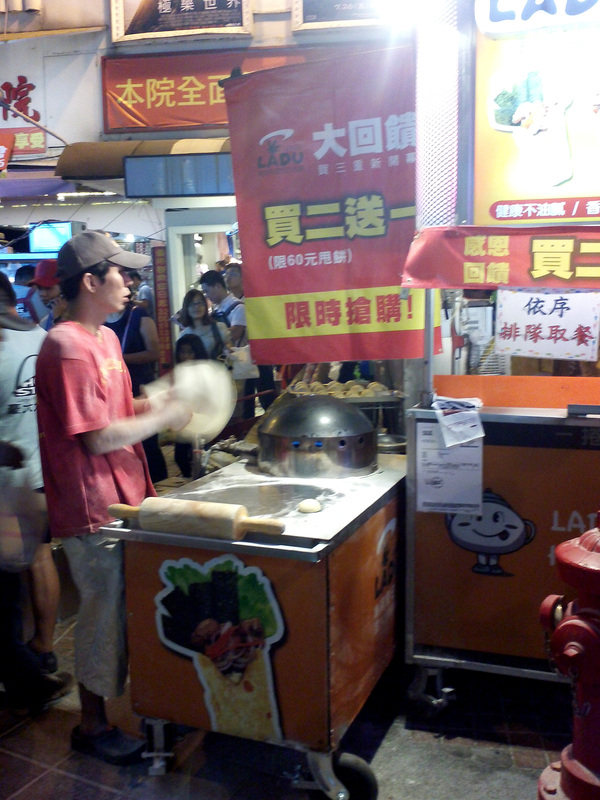 Why go there: The Shilin Night Market is the most popular of Taipei City’s “night markets.” A shopper’s paradise with a carnival atmosphere, the night market tempts the senses and tries one’s patience with exotic, robust tastes and aromas combined with seriously backed-up foot traffic. Regardless of what you’re looking for, this night market has it. Foods from around the world can be purchased conveniently and cheaply from countless street vendors. If you stop nowhere else, be sure to hit up the Hot Star Large Fried Chicken stand. The stand is easy to find, just look for the long line of people waiting patiently with the same look on their faces that a hungry dog gives to a three-legged cat. 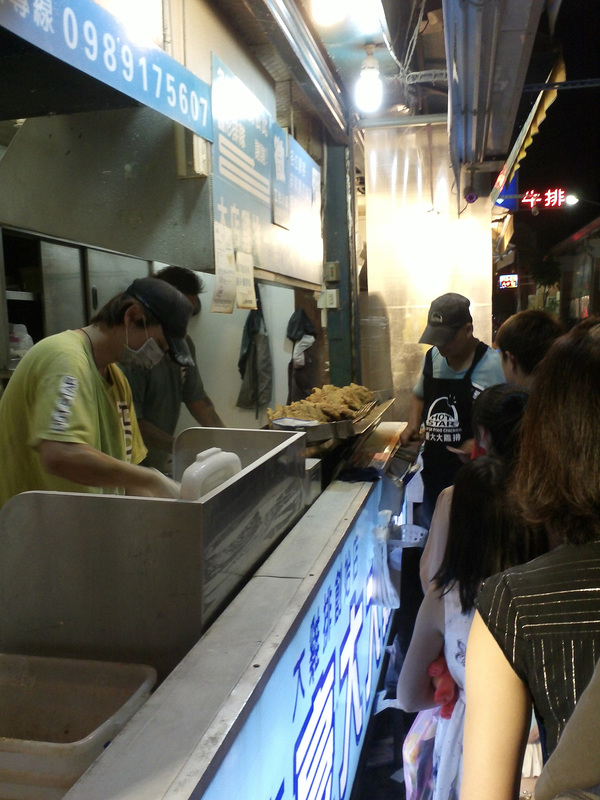 The Hot Star Large Fried Chicken Stand…there’s always a line up here, and for good reason! Fried chicken not your thing? Try any of the other street vendors. 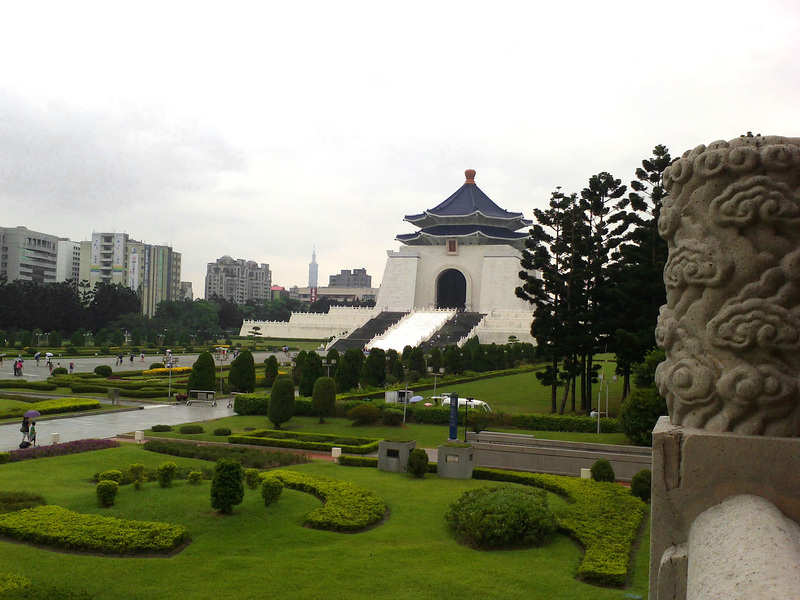 The Chiang Kai-shek Memorial Hall, with gardens in the foreground. 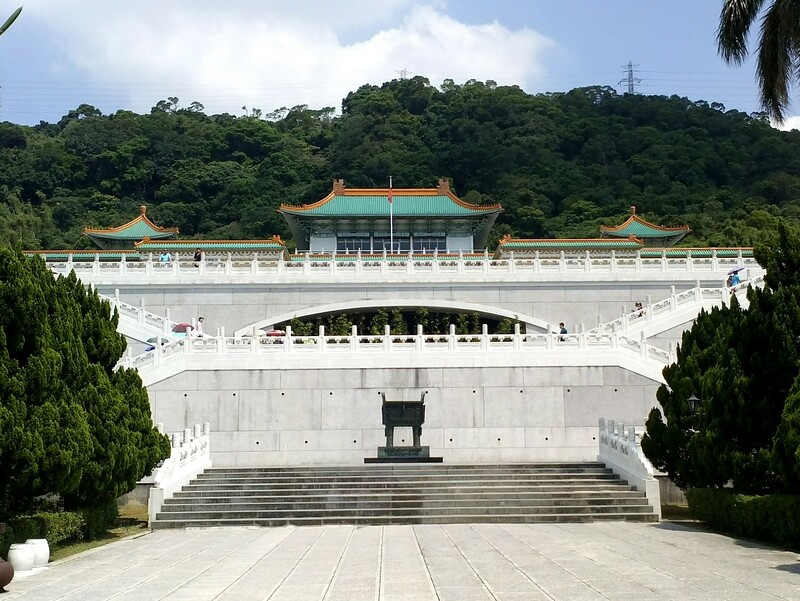 How to get there: The Chiang Kai-shek Memorial Hall is accessed via the MRT Tamsui Line (Red Line). Simply get off at the Chiang Kai-shek Memorial Hall Station; this is also a transfer station for the Xiaonanmen Branch Line. A map of the Taipei MRT. The Chiang Kai-shek Memorial Hall Station is circled in red. 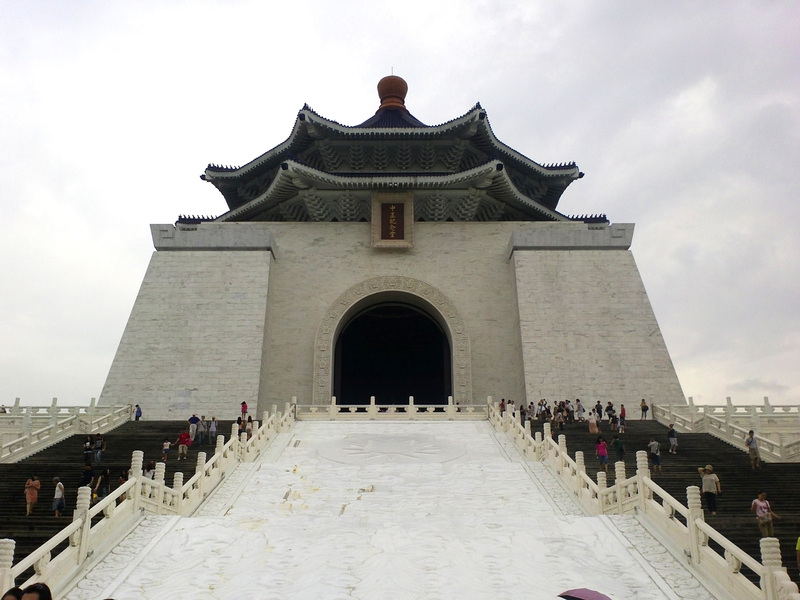 Why go there: No trip to Taipei City would be complete without a visit to the Chiang Kai-shek Memorial Hall. 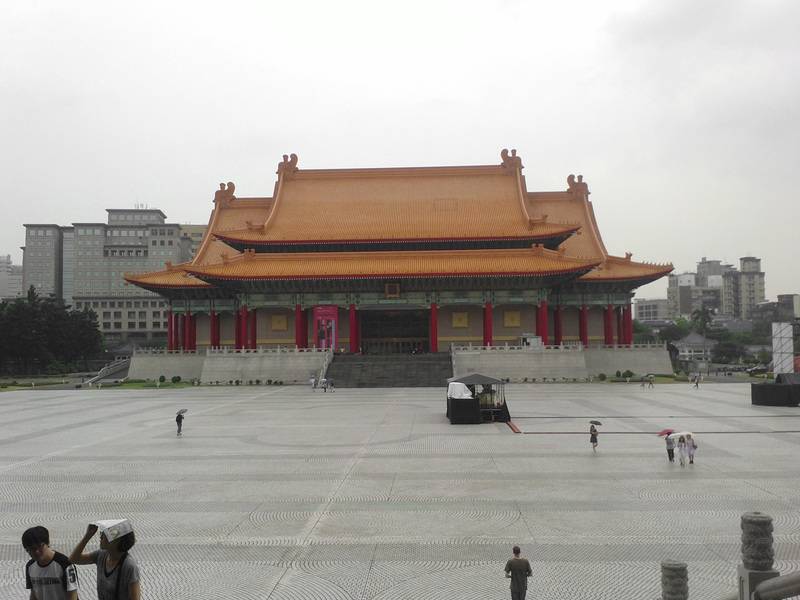 Built in memory of the late President Chiang Kai-shek (1887-1975), the Memorial Hall is a popular tourist attraction in Taipei City. 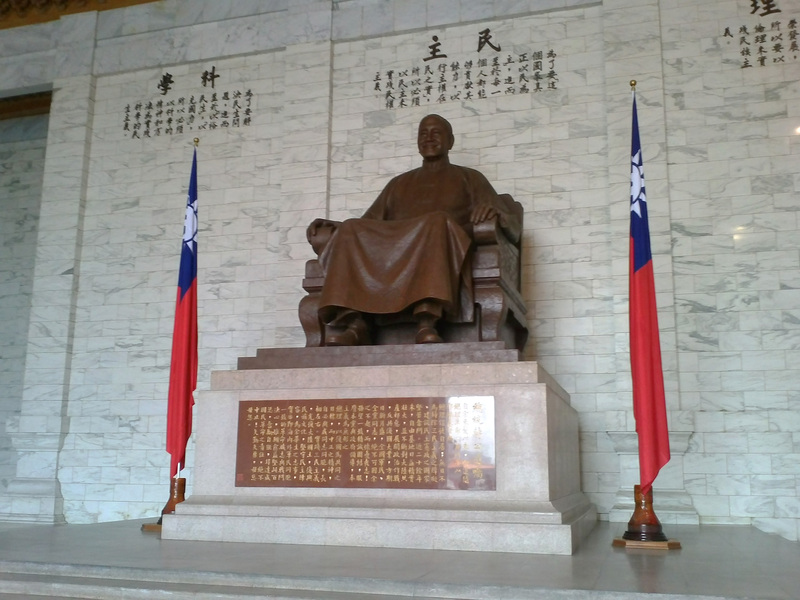 The main Hall houses a statue of the late President, and the lower levels of the Hall are home to a museum portraying the President’s life and military and political history. Many unique and rare artifacts, such as the President’s car, reading glasses, and military service medals, are on display in the museum levels. The National Concert Hall at the CKS Memorial. The imposing facade of the CKS Memorial Hall. There are 87 stairs to reach the main hall, one for each year of the President’s life. Inside the Main Hall at the CKS Memorial. Members of the Honor Guard are on-site at all times; on the hour there is a changing of the guards which attracts many visitors. 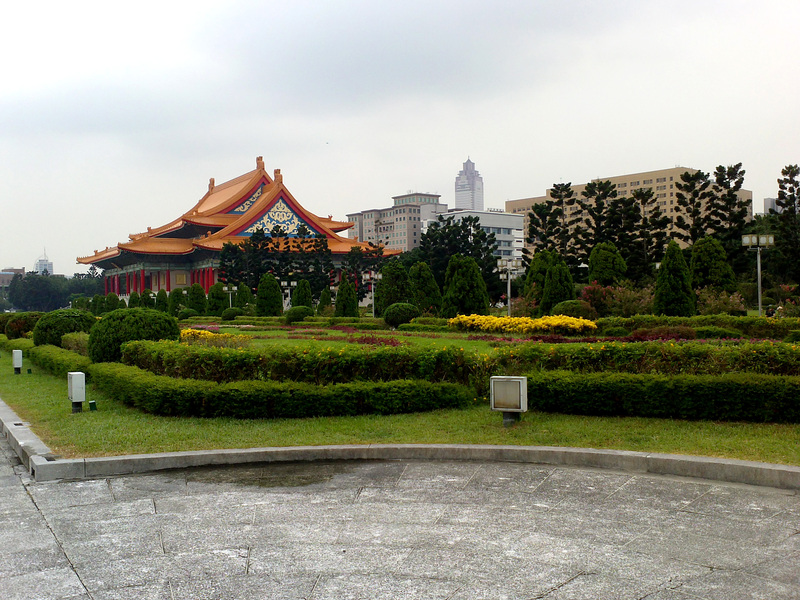 The Memorial Hall is just one part of an expansive square, which serves as a popular public meeting place and the location of the National Theater and National Concert Hall. Twin gardens adorn either side of the square, and there is an impressive gateway at the main entrance to the square. 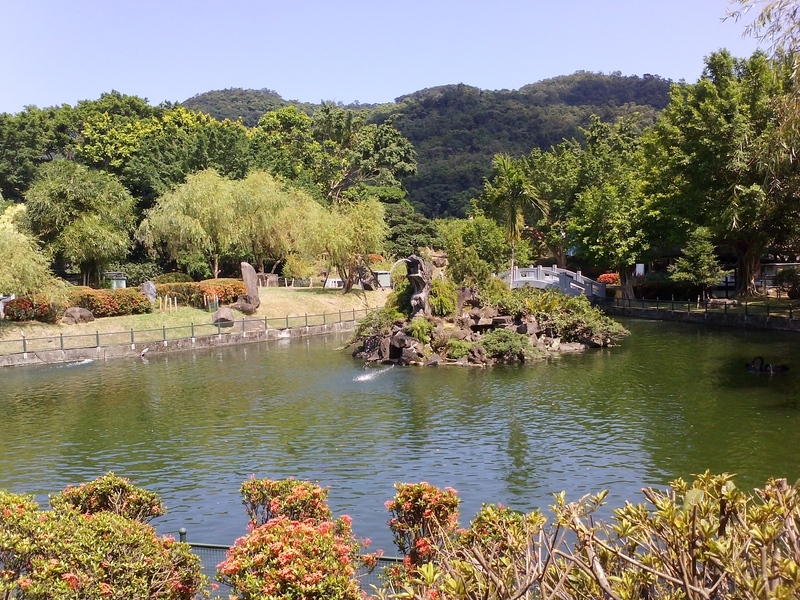 These small oases in the concrete jungle of Taipei City also attract a wide variety of wildlife. The koi ponds are host to many fish and turtles, and Eurasian moorhens breed here. In the late summer you can see and feed the small chicks as they swim around the pond. One of the koi ponds at the CKS Memorial Hall. A view of one of the garden plots at the CKS Memorial Hall. The National Concert Hall is in the background. All manner of bird life can be found in and around the gardens. 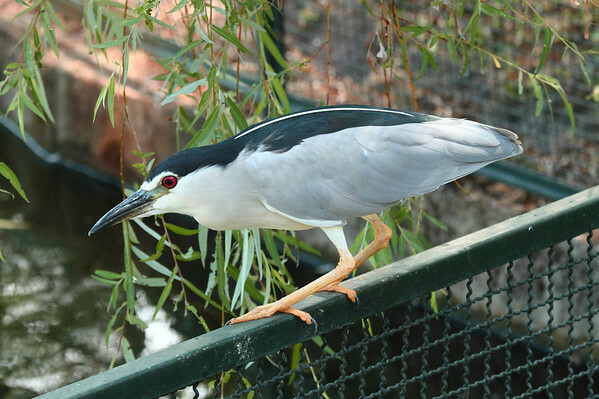 Including the moorhens, black-crowned night-herons and Malayan night-herons can be found at the ponds and throughout the gardens. 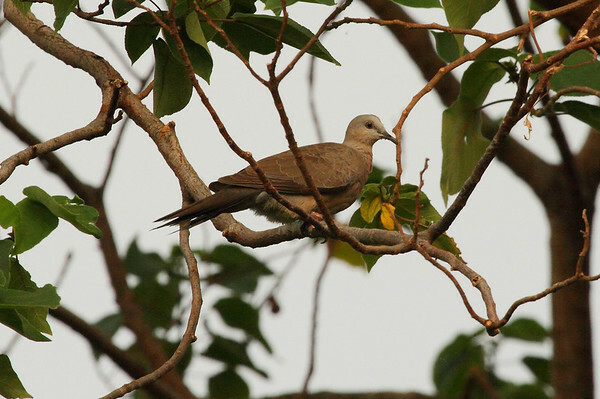 Common and Javan mynas are plentiful, as are spotted doves and red collared-doves. 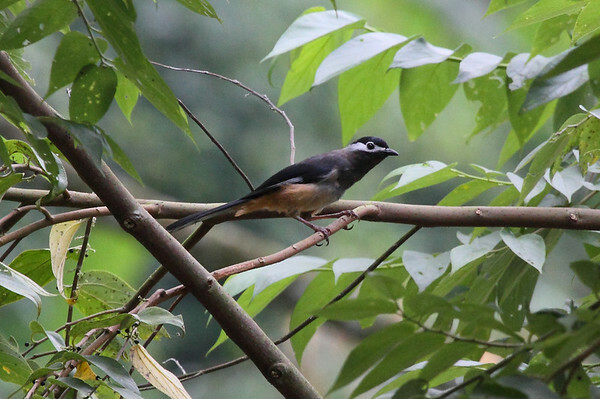 On my visit to the CKS Memorial Hall, I found several light-vented bulbuls and Japanese white-eyes, black-collared starlings, and black drongos. 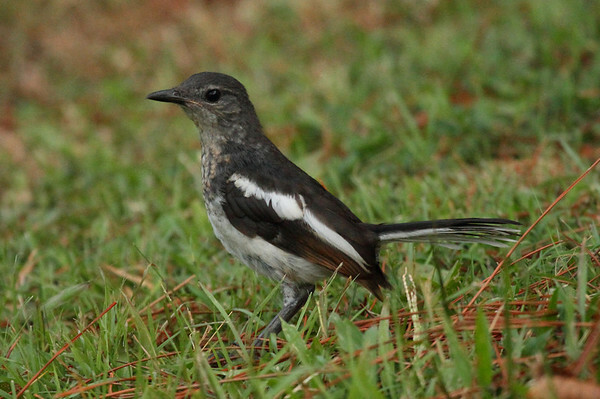 You may also find grey treepies and oriental magpie-robins. Head over there at dusk to watch the sky fill up with Pacific and barn swallows, and maybe even the occasional bat. 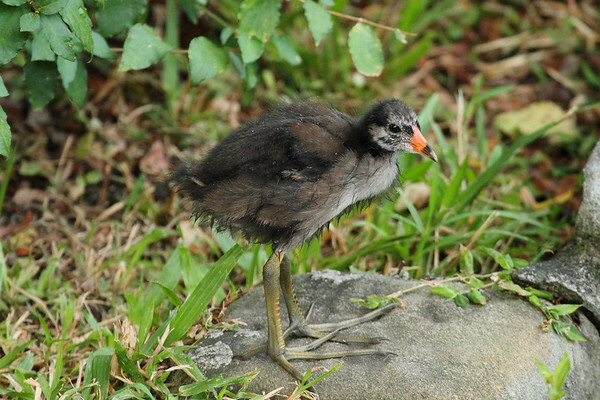 Juvenile Eurasian Moorhen (Gallinula chloropus chloropus) at the CKS Memorial Hall koi pond. After striking pay dirt at the Taipei Botanical Garden, bagging eight lifers in just a few hours, we decided to switch tracks for a little while and experience the more cultural side of Taipei. 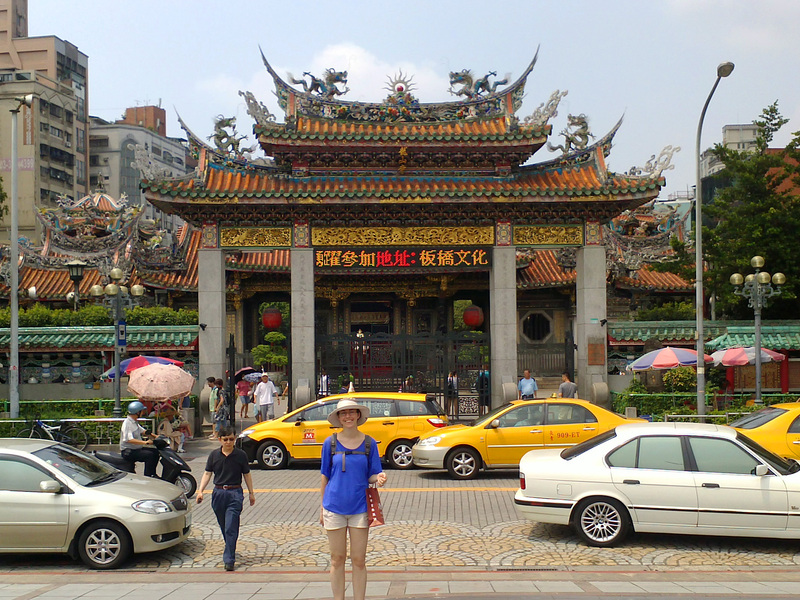 Melanie had looked into some of the local temples, and the Xingtian Temple (行天宮) was one of her top picks. Taipei MRT Map. Xingtian Temple Station is circled in red. 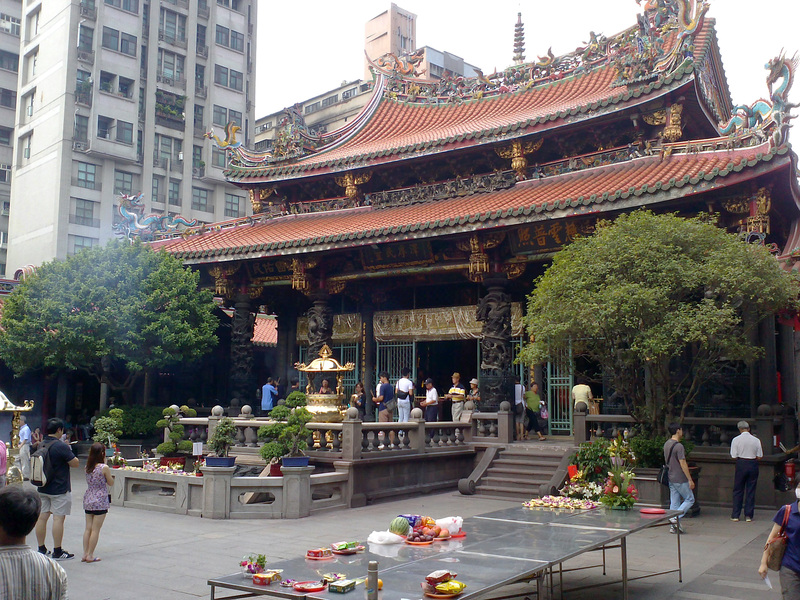 Xingtian Temple does not have a long history, unlike some of the other temples in Taipei, but it is one of the city’s busiest temples. It was built in 1967 in honor of Guangong (162-219 CE), a famous general who was deified and worshiped as the god of war and the patron of knights and those who follow a righteous code. 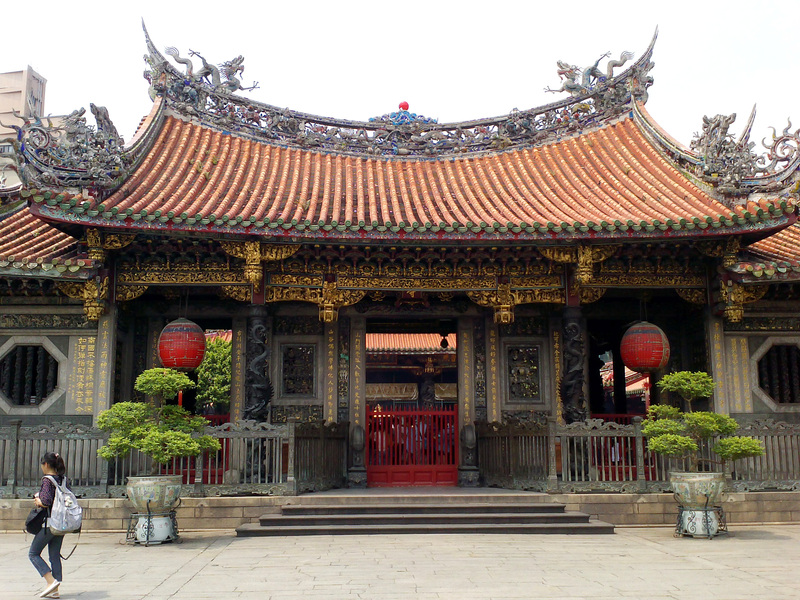 This temple is also significant to people in business, as Guangong was said to be very adept in finances. Melanie poses in front of the entrance gate at the Xingtian Temple. Meanwhile, Taipei traffic continues unabated. The main entrance to the Xingtian Temple. It may not show well in this photo, but the detail in the carvings adorning the rooftops is simply astonishing. Inside the Xingtian Temple, supplicants present daily offerings to the deities of the Temple. The central structure here houses one of the Buddha images in the temple. At this point we had been birding and sightseeing for half of the day. Melanie was getting a little tired, so she decided to head back to the hotel and catch up on some reading. 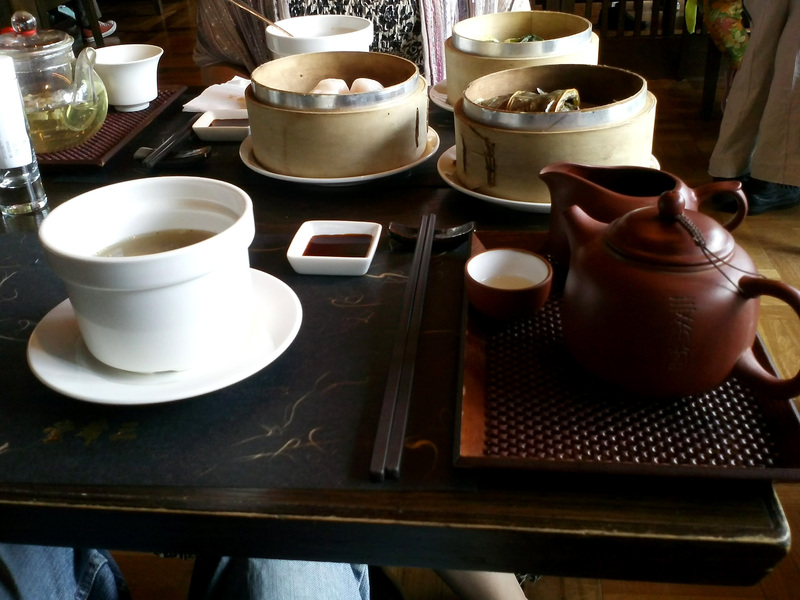 I pressed on and went to the Hua Jiang Wild Duck Nature Park (永續公共工程). 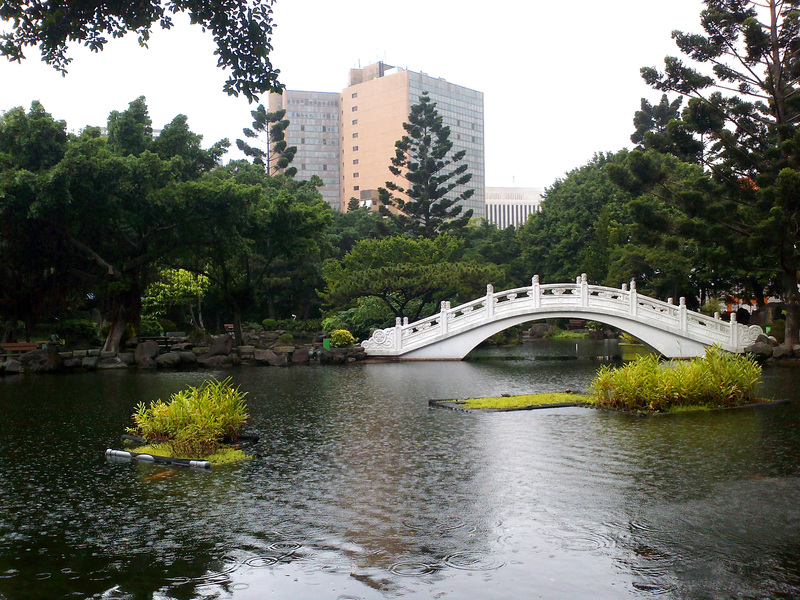 This planned park is nestled along the Tamsui River, and is a short walk from the Longshan Temple MRT station. From the Longshan Temple station, follow Xiyuan Road, Section 1, north towards Guilin Road. Make a left onto Guilin, and follow it to the expressway; Hua Jiang is on the other side of the expressway, just take the underpass entrance. There is a well-traveled bicycle path along the Tamsui River, and this constitutes the main walkway through Hua Jiang. The park itself offers great views of the river, and has enough diverse habitats to make the birding interesting. 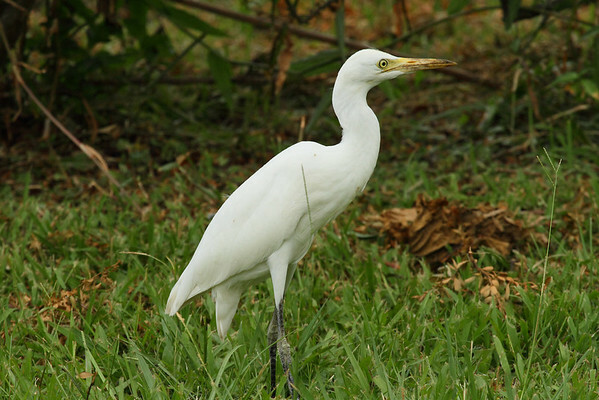 Upon arriving, I was greeted by at least twenty cattle egrets foraging on the lawns. By this time of year most of the egrets had lost their orange color, so they were a little trickier to identify than usual. There were also a plethora of mynas, including common mynas and Javan mynas. Two spotted doves were picking through the grasses. I decided to head north for awhile, following the river in the hopes of spotting some interesting herons or perhaps some shorebirds. The water was low in places, revealing mudflats, and hidden in the vegetation I found three Eurasian moorhens and an adult white-breasted waterhen. A single common sandpiper and common greenshank were the only shorebirds around. There were also a few black-crowned night-herons, little egrets, and a common kingfisher to the north of the Park. 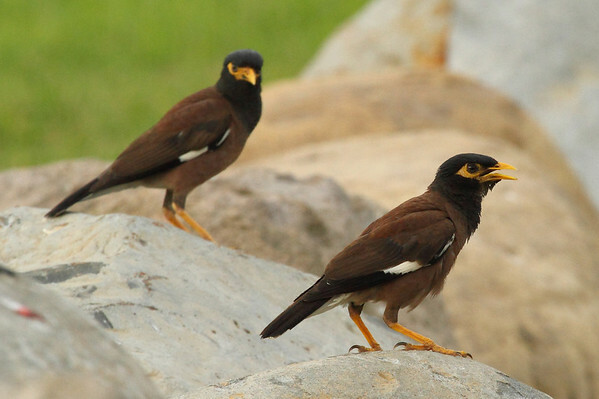 Common Myna (Acridotheres tristis tristis). These were very numerous at Hua Jiang. Heading south into the heart of Hua Jiang led me past an expansive mudflat area. In the reeds I found three plain prinias flitting about. Several groups of shorebirds were out on the flats, including the resident little ringed plovers, a few more common sandpipers, and two migrant black-bellied plovers near the waterline. The most impressive species, however, were the half dozen or so sacred ibises. 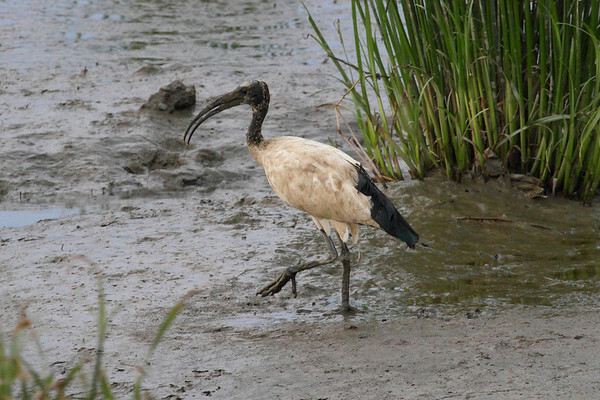 A Saharan species, the sacred ibis was introduced to Taiwan, and there are now an estimated 300 ibises throughout the country. Sacred Ibis (Threskiornis aethiopicus aethiopicus). 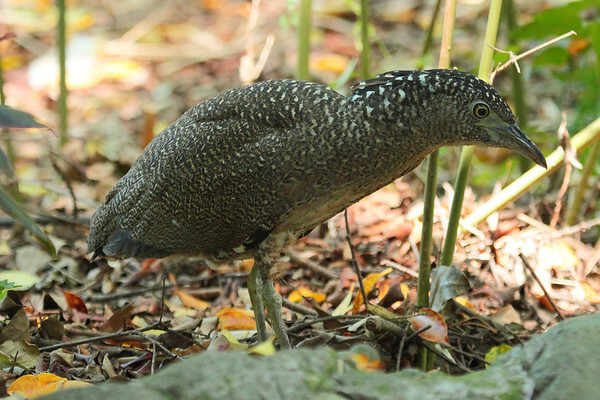 Although an introduced species to Taiwan, it is nonetheless an incredibly impressive bird. 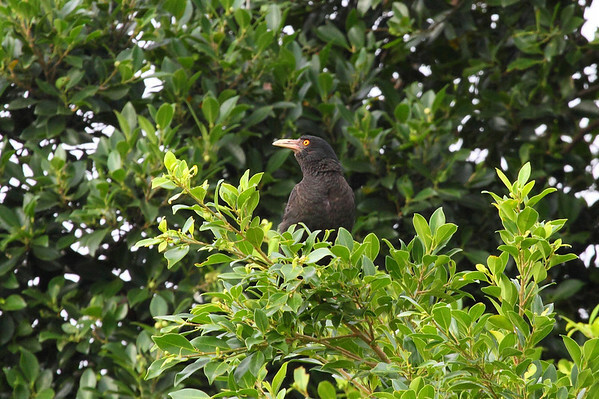 Picking through the masses of mynas on the lawn, I was able to locate three crested mynas hiding in a large tree. 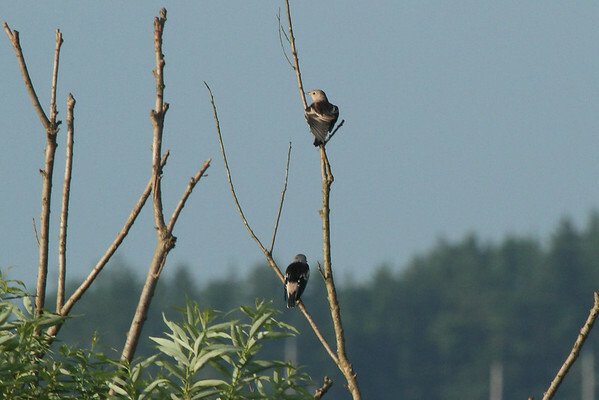 Black-collared starlings called from the trees and tall electrical towers nearby. Every step along the bicycle path flushed countless Eurasian tree sparrows, and one flock contained a few Indian silverbills. These small finches are common cage birds, and resemble tiny sparrows with large bills capable of cracking seeds. Crested Myna (Acridotheres cristatellus formosanus). 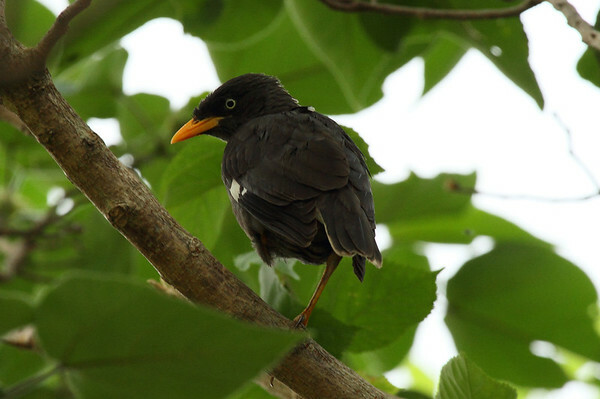 Lacking its crest, the long bill and reddish eye differentiate this bird from the similar Javan myna. 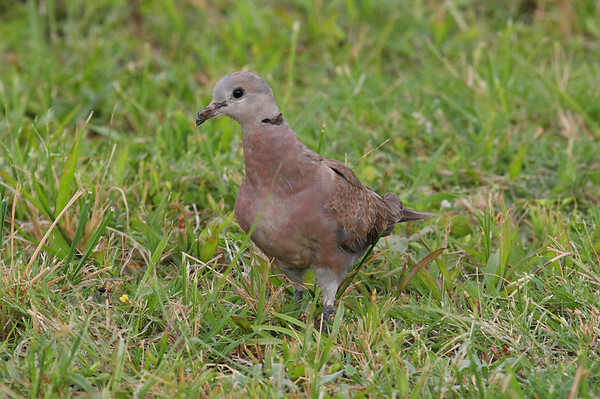 A juvenile Red Collared-dove (Streptopelia tranquebarica humilis) foraging with the common mynas. For such a small park, Hua Jiang Wild Duck Nature Park packs the proverbial punch when it comes to delivering on a variety of bird species. The sun was getting low in the sky, and my feet had decided that enough was enough. Just before calling it quits, I spotted a yellowish heron flying low over the reeds. I got the binoculars on it in time to ID the bird as a yellow bittern! No sooner had it appeared than it dropped into the reeds and vanished. I returned to the entrance to Hua Jiang, satisfied at having bagged another eight lifers. I wouldn’t get another chance to visit Hua Jiang before leaving Taiwan, but it had definitely been worth the trip out. Our first full day in Taiwan came to a restful and relaxing close.